Everything was draped in “Black & White” at The Kennedy Center’s 52nd Annual Four Seasons Ball. Tablecloths, floral centerpieces, evening gowns and tuxedos, were immersed in a sea of black and white elegance, in keeping with this year’s dramatic theme. The ballroom at Rolling Hills Country Club in Wilton was packed with a sold-out crowd of 220 guests. Throughout the night, patrons enjoyed the lavish hors d’oeuvres and delectable three-course dinner as well as the lively dance music of Cracked Ice, which got everyone to their feet. This successful charity event raised over $106,000 for The Kennedy Center’s residential services for people with disabilities. Since its inception in 1965, the Four Seasons Ball has contributed over $2 million to The Kennedy Center and is one of the longest running, most popular charity galas in Fairfield County. This year, two outstanding couples were recognized as Tribute Journal honorees. Nancy and Joe Dennin of Trumbull, and Bonnie and Steve Smith of Shelton were feted for their exceptional dedication to improving the lives of individuals with disabilities. In addition, they are both parents of a child with disabilities and have volunteered and supported The Kennedy Center for countless decades. 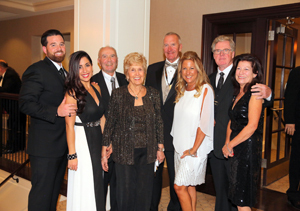 The ball was enthusiastically co-chaired for the first time by Michele Macauda and Richard Burke of Monroe. Also playing a major leadership role, were Bill Purcell of the Naugatuck Valley and Elizabeth Capobianco of Milford, co-chairs of the Tribute Journal. Many sponsors contributed generously to make this celebration special. The Platinum Sponsors were GE/Energy Financial Services, Dorothy B. Larson of Fairfield, Michele Macauda and Richard Burke of Monroe, and People’s United Bank; Sapphire Sponsors included the Dennin Family of Trumbull, William and Gloria Paul Family Foundation, and R. D. Scinto, Inc. At the Emerald level were Anne and Peter Foley of Fairfield and Fairfield University, while Ruby Sponsors included Merit Insurance, BlumShapiro, Pullman & Comley, LLC, the Smith Family of Shelton and Unilever. As part of evening’s festivities, Fund-A-Home donations were collected and are being allocated for the renovation of Old Good Hill Home in Oxford. This residential group home for five residents needs a new roof and gutters as well as ADA updates to two bathrooms. Although some state funding is available, it does not cover the total cost.